dJAX Enterprise Adserver is a simple, integrated and one-of-a-kind ad serving solution for online media companies to run ad operations on their websites, mobile screens or online videos. This is basically a package of tools and plugins which includes a dJAX Professional Adserver, a SSP and a DSP integrated with XML feed features and Affiliate features in addition to having an In-game ad plugin. The latest RTB technology, Delivery capping and advanced targeting techniques that are built into it ensures optimistic results both on operations and revenues. Effectively monetize traffic- It allows Publishers to sell their ad inventory beyond their ad network, to communicate with other ad networks and ad exchanges for better monetary gains, in real time and in an automated manner, termed as 'Programmatic Selling'. Advertise globally- It allows Advertisers to look for ad inventory across many ad exchanges and ad networks and buy the best spots for their brand campaigns in real item and in an automated manner, termed as 'Programmatic Buying'. Rich interactive- It supports all the advanced and successful ad formats such as Text, HTML, Image and Flash ads for display and Image, Text, MRAID and IAB Rising Star Ad Formats for mobile. Request & Response- This expands the buying and selling ads for Advertisers and Publishers by connecting the dJAX ad server to XML Feed networks. By reading into various parameters set for different Publishers, it either automatically gets feeds from other XML based networks and displays the best bid feed as text ad or generates a feed using XML Feed Generator which can be picked up by other networks. The rest API support provides access to inventory and reports in the platform by an authenticated user using the formats of XML, CSV, JSON, and PHP Array. Manager module- This ensures more revenues for the product owner by allowing him to subscribe the package to other business units who want to set put their own ad network on a fixed subscription amount for a period. This provides admin support in an organized manner so that the product owner can centrally have control over his subscriptions. 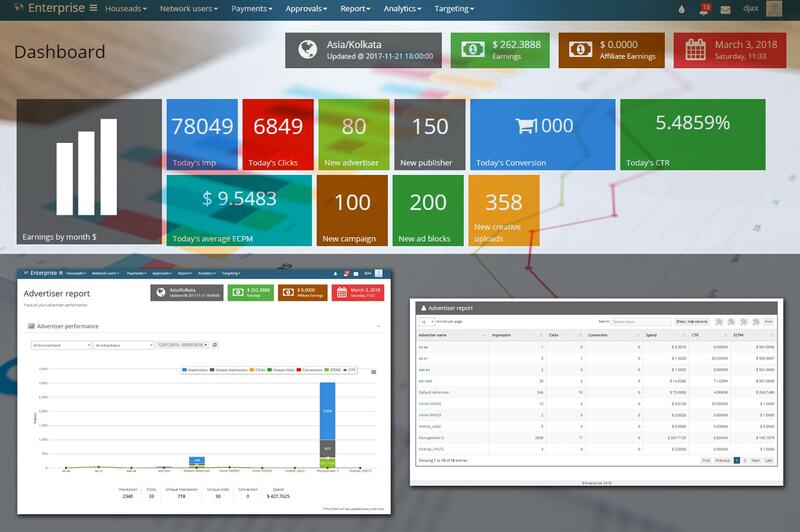 Handy reports and solutions- This feature allows measuring traffic, studying user purchase details, browsing habits etc and reporting them in various user-friendly formats. The security management system prevents the fraudulent clicks made by hackers or anonymous and protects the publisher website and avoids unnecessary payment of advertiser. The user can customize the option to detect the fraud clicks. Right audience at right time- Owning your own online media enterprise, you will keep tracking the visitors of the site on various factors like location, behaviour, interests etc. Tracking them, targeting them in real time and serving ads accordingly becomes easy with dJAX Ad Server. Web Browser: The ads are delivered according to the visitor browser. Operating System: The advertiser can choose the selected OS to deliver the ads. Time: The advertisement is delivered based on the time selected by advertiser. Geographic (Country): The ads are delivered to targeted countries. Frequency Capping: The advertiser can define the impression count per hour. Behavioral Targeting: The ads are delivered if the campaign and website categories are matched. Demographic Targeting: The ad is delivered if the values of gender, age, height, and weight are matched on the campaign and zone side. IP Targeting: The advertisement is delivered within IP range. Mobile manufactures: The advertiser can deliver the ads to selected mobile manufactures. Mobile browsers: The advertisers are delivered to selected mobile browsers. Mobile capability: The user can additional mobile targeting feature in admin panel and can Perform targeting in campaign level. The mobile height, width and IsWiFi model and their values are fetched from terawurfl. Video: Video ads has browser, operating system, time, geographic (country), frequency capping, behavioral targeting, demographic targeting and ip targeting. Increase brand curiosity- Re-targeting, an advanced feature in dJAX Ad Server, helps to record the behaviour of a visitor and further breaks down the targeting to deliver ads that are of that user's interests which in turn gives great chances of turning user engagement into a sale transaction, helping advertisers' achieve their goal. To peel off fraud Interference- This package analyzes and detects all types of fraudulent clicks and thus helps in saving your time and money. It also allows to customize how you want the frauds to be detected. Bid & Earn- This optimization technology helps advertisers both advertisers and publishers targeting users dynamically and which benefits advertisers in paying only for the valuable users and earn more revenue. Publishers earn more through highest paying advertisers. Choose your style- This package has many templates and allows the user to choose a template for his ad server, depending on his line of business. Customized templates can also built based on user requirements. Payments made easy- Payment System provides both Prepaid and Post-paid options for Advertisers which would help in planning their budgets. Easy-to-use interface for both advertisers and publishers to add funds, handling daily spends etc and trace commission payouts respectively.